On the southeastern end of St. Thomas, lies the private beach of Cowpet Bay. Our villa is surrounded by lush tropical plantings and has an expansive view of the surrounding sapphire seas and neighboring islands. Whether you are looking for an intimate island hideaway or a well-situated home base from which to go forth on adventures and exotic explorations, our Cowpet villa is for you. Cowpet's beach offers swimming, snorkeling, sunfish rentals, and kayaking. Chairs and chaise lounges are provided, along with plenty of sun or shade under the palm trees lining the beach. Our villa is spacious for a couple, roomy for two couples, or well suited for a family of four. The view is sensational! A seaside gallery provides an open-air covered balcony with both outdoor dining for four and comfortable seating from which to gaze out to the scattered islands of St. James, St. John, and Tortola. The British Islands are our neighbors and water taxi services, rental boats, or ferries can easily transport you to their nearby shores. Cowpet Bay is conveniently located within walking distance to the Caribbean Fish Market, an open-air restaurant on the beach serving breakfast, lunch and dinner and to Sangria's beach cafe. The elegant resort hotel, The Ritz Carlton, is also within walking distance. The nearby village of Redhook is minutes away by car where fishing charters, boat rentals, restaurants, bars, and markets provide access to every amenity. Catch the local ferry departing every hour from the Redhook dock for a day or evening of fun on St. John. In downtown St. Thomas, the town of Charlotte Amalie located along the waterfront, provides the most exciting shopping in the world where duty-free status affords remarkable pricing for bargain hunters of the finest names in crystal, china, jewelry, watches, cameras, clothing, and more. A 15-minute drive from Cowpet will take you to the spectacular Mahogany Run Golf Course. Cliff-side tee boxes, tropical forests, lakes, and unparalleled ocean views create a dramatically challenging, 27-hole course for your enjoyment. We know you will enjoy your island vacation in our spectacular seaside villa. 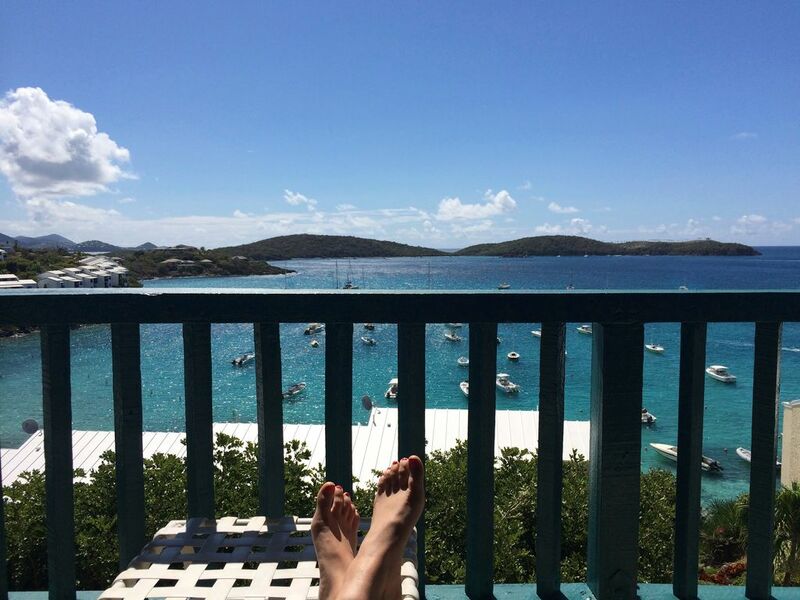 We love coming to St. Thomas for a bit of wind-down time of fun and relaxation. In addition to our own fabulous beach, our favorite places include the beaches in St. John, Lindquist Bay, a day at Maegan's Bay - followed by a milkshake stop at the dairy on the way out; and a fun-filled day of island hopping and snorkeling by boat which can be rented by the day. Our family has owned our place in St. Thomas since its construction in the late 1960s. Our parents brought us here as children and now we enjoy bringing our children, as well. It has been our home away from home for many years and we have very fond memories of Cowpet Bay and the neighboring smaller islands before they became popular tourist destinations. We enjoy our own beautiful beach and the wonderful amenities, particularly the restaurant and beach cafe. Red Hook is just minutes away making an easy trip to St. John via ferry. Inside dining area seats four to six. Outdoor dining area seats four.